Do I sound too childish if I tell you that I'm easily fascinated by watching plastic shrink? I'm working on things for an upcoming fête at the moment. I wanted to make more jewellery and make it fairly affordable. 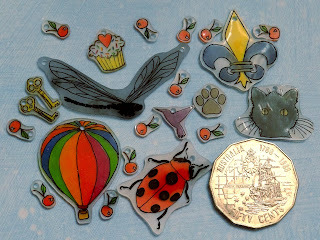 At the moment I don't really have the space or set-up to get out all of my jewellery stuff so I decided to have a go at shrink plastic. My first few sheets were so bad they didn't even make it to the oven - I'm having tremendous difficulty getting stamps to transfer the entire image, and at first I did not know what kind of ink to use. I found that a waterproof fineliner worked just fine for the black lines - although it doesn't truly set until baked so needs to be handled carefully it comes with the bonus of being able to redo difficult bits. Coloured pencils provide great colour, especially as baking concentrates the colour. I also now sand one side before I start. These are destined to be necklaces and earrings, the 50c piece is for scale. The cherries will probably go onto a bracelet - one on each chain link. I'll have plenty more time to do this when I get back. I'm off now for a week and a half. I'll return in early November with a TARDIS card tutorial and photos of Uluru.